I mentioned I was doing a draping class this term, and asked for skirt inspiration. I gathered (ahem) some great ideas from you. Phew – great thinking ladies! Here is a summary of my thinking to date – however my thinking will develop once I get the fabric in my hands. My teacher has kindly allowed me to drape in actual fabric rather than calico, so I may take a nice piece of checked fabric into my class. I love Vivienne Westwood’s designs, and I have tried to copy what she does before when I made a jacket. Vivienne Westwood uses draping to create many of her looks, especially the skirts and dresses. Here are some skirts. By using stripes or plaids we can see what is going on. I love this look, and one of my priorities is to try this for myself, playing with the grain to create a nice but unusual shape. In this pattern I would like to use one of the sheers I have been researching – either silk organza or silk tulle. 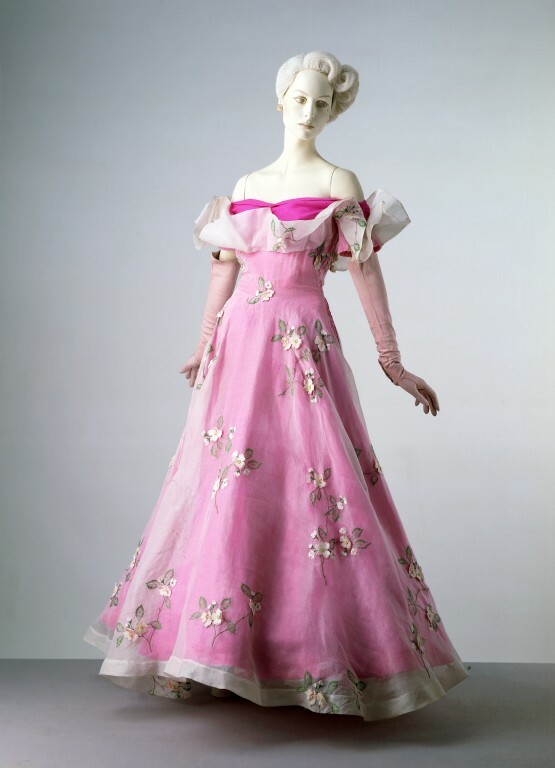 In this Schiaparelli dress the organza is peeled back to reveal the shocking pink underdress. It also features embroidery. Something to think about. I am keen to try an asymmetric pattern, to increase my range. Sam included this image, saying she was planning a coat with a similar look. I thought that was a great idea, but also wondered if it could be adapted to create a wrap around skirt. I like the way that the fullness of the flares come out at one side only. This will be technically challenging I think. 4. A fullish, winter skirt, with pockets, suitable for work, perhaps using a tartan. My namesake, amazingly talented knitting designer Kate Davies, recently got married. You can see the full length kilt she wore for her wedding, and a midi kilt worn by her bridesmaid and other striking images at Kate Davies designs. Her skirt was made by Scottesque, who certainly have some wonderful ideas. One of my draping books (Karolyn Kiisel) includes a kilt exercise. 6. A ballet skirt. I am thinking of a fairly short, very full skirt. You have collected such a lot of inspiration skirts here, very different from each other. The skirts illustrated at 1 and 4 cry out to be draped rather than flat drafted, especially the Westwood ones. The others I would probably flat draft, then check in a toile. I have the 80s pattern – I’ve no idea how it came into my pattern stash, but I recognise it from the last attempt at organising. The Westwood coat idea would work as a basis for a skirt, I can see some playing around with the positioning of the curved seam in relation to the waistband (or no waistband, raised waistline?). Thanks for your feedback Jay. I have found you can drape just about anything, but there are some things better done flat. I wonder if I can figure out what and why. Also your coat feedback is helpful. I think it is quite hard to achieve. I love those Vivienne Westwood skirts – you know I’m a Westwood fan! I need to learn draping so I can have a go at one of those. If I crack it I will reveal how to do it Sam. I particularly like the first set of westwood skirts – they seem more wearable than the others, while still retaining some excitement! How fun to take a draping class. Yes – I did have a skirt like the third VW one and a woman stopped me on the bus and told me my skirt was tucked into my underwear! That’s a difficult choice to make with all that inspiration! I love the striped skirt – but I’m also a fan of the short, full skirt. If it is accompanied by a cropped jacket like that check one all the better. Thank you for the link to Kate Davies’ post about her wedding, I really enjoyed reading that. Enjoy your draping class. You have found so many choices for inspiration. If you haven’t seen it, check out the draping book by Annette Duburg. Amazon has it for crazy prices but it was republished and is available at centerforpatterndesign.com. It’s my absolute favorite draping book and I have most of them including the Karolyn Kiisel. I love the Kate Davis draped kilts. Perfect for plaids. Mary – I got the Duburg book second hand on your recommendation – it seems very advanced, and I will move on to it once I have done a few more classes. I love the coat style and the asymetry of the design. I have never done draping – looks interesting. Like the others, I love the VW designs. The other Kate’s wedding outfit was gorgeous. I passed the link on to Gianni at the time to encourage him to consider wearing a kilt! Wonderful post Kate. I love the asymmetrical skirts. 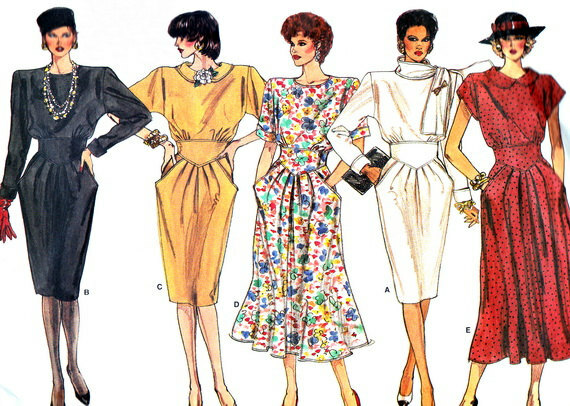 I think the one I like best for you would be the one with the yoke waist (number five) it would look fabulous on you! My fingers are crossed for some embroidery, and layers of beautiful thin fabric. Good luck with this project, looking forward to seeing what creative results you will come up with. Fun fun fun. Well, I vote for number 3…but without much knowledge since I don’t wear skirts. Would you never wear a skirt Lynn? I wear them most days, but usually jeans at the weekend. Those Westwood skirts are poetry with cloth. And I think that style would quite suit you. But if you remotely think you would have an opportunity to wear a full length skirt with a sheer overlay and embroidery I would love to see it! I take the view that you can wear anything, if you wear it right. My full length circle dress has been worn many times, but always dressed down. I feel the same with a fancy evening skirt – wear it with a T shirt and flat shoes. The coat! It is absolutely glorious and would suit you very well. The coat is a lovely shape. As for the skirts, the striped one is the one that appeals most to me. Love the striped skirt. I’ve recently made one which was seamed not draped. The draped effect is stunning. I agree. It’s very interesting. I love the way Westwood drapes plaid and I’d really like to see how it’s done for a skirt. Draped tartan always makes me think of autumn and boots and I adore that time of year. Absolutely. So glad October exists. I haven’t worked this out yet, but I will. It’s such a fun look – radical and traditional. Right up my street. I love the Kate Davies skirts in number 4. Frankly I am just in awe of anyone who is draping as I didn’t enjoy the little I did in college but can see how useful it would be to improve. I wait with baited breath for the choice. I think the Kate Davies wedding skirt is amazing Kim and I really like what they have done with a kilt. For me the draping is very freeing and somehow immediate and experimental.